I never said what kind of water!!!! I'm making this today, friend! The cranberries don't get cooked at all? Not in this recipe. I've done both cooked and uncooked, and I definitely prefer au naturel. "He somebody you cowboy'd with?" "It is required of every man that the spirit within him should walk abroad among his fellow-men, and travel far and wide." --Charles Dickens. Hunh. Didn't know you could eat raw cranberries. I bet it's exploding with vitamin C.
You bet, Elle. 'Nother good raw cranberry relish recipe is Mama Stamberg's, which Susan Stamberg always discusses on NPR 'round Thanksgiving. It contains the cranberries, onion, and sugar and also throws in horseradish and sour cream. I love it, but some guests turn their noses up at it...can't imagine why!! So, I've made the relish which is mellowing in the fridge, and now I'm going to make the Cumberland sauce!! Break out the port!! May 2019 be better for us all. Good idea to let the relish mellow, Lee. Raw cranberries are great! If one doesn't want to use sugar, just use more oranges. I made a pear-quince pie in October. What happened is that I learned that my daughter and her husband would be making a visit on a Sunday afternoon. I hadn't seen them for almost a month even though they live in the same town as us. But, there was a major Jewish holiday (they are a version of Jewish) which required them to be at church or sequestered for days on end. I was suddenly in need of a dessert! So I reached for Pillsbury pie crust and filled it with sliced pears (the pears have been very delicious this year) and then poured a mixture of membrillo, spices, and preserved dried fruit over the top. What is membrillo? It is quince paste, and it made a wonderful tangy/sweet, clear filling for the pie. Served warm with vanilla ice cream, it was a hit!...to my husband and son. My daughter and son-in-law said they weren't hungry, were just visiting and didn't want to eat anything (we had also prepared pot roast, french bread, and a selection of appetizers which they nibbled on). When I went apple picking this year with friends in Rhode Island, in addition to the usual macouns, matsus and empire apples, there were these gorgeous, huge, ancient quince trees loaded with fruit. Apparently, very few people want the quinces, so they were practically free. Jackpot! It was a very good year up here for quince, and they smelled divine. My car still smelled of apples and quince even after I had brought them in. 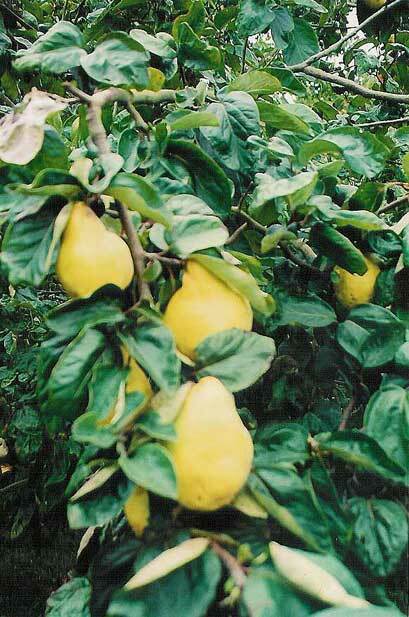 Definitely look for good quince chutney, it's worth the hunt! My daughter and son-in-law said they weren't hungry, were just visiting and didn't want to eat anything (we had also prepared pot roast, french bread, and a selection of appetizers which they nibbled on). If it was a holiday, maybe they just didn't want to appear to complain that your food wasn't kosher? Possibly...she gave me a list of things they can't eat. Every time we get together, I find out about something else that's not on the list. I was planning to make a mincemeat pie, but it turned out that suet is not allowed, even though it's from beef, not pork. Go figure.